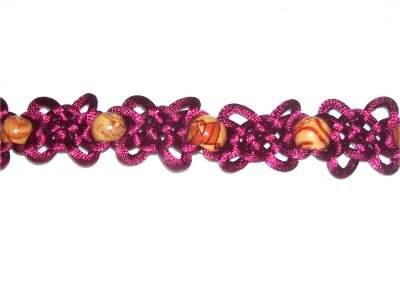 Description: The Loop Weave Bracelet features one of the Celtic Mat designs called the Basket Weave. You will be changing the shape slightly, pulling out four loops in the corners of each knot. 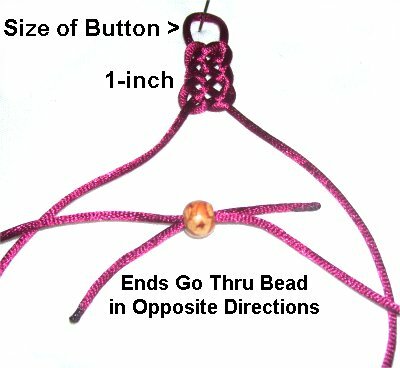 Beads should be used to decorate this Micro-Macrame bracelet, to separate the knotted areas. In the example shown, the bracelet was made with Satin cord material and painted wood beads. The closure was a simple loop-button clasp. When using Satin material, do not put pins through it, since it's delicate. 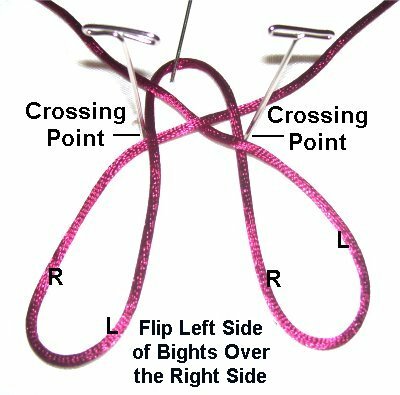 Instead, lean the pins over the cord, or use the Cross-Pin Technique. 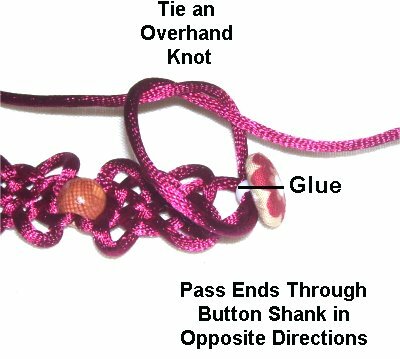 This bracelet design is easy enough for beginners to make, provided you have practiced the knots used in this pattern. Step 1: Cut 1 cord, at least 72 inches long (2 yards). Prepare the ends with glue and allow it to dry before tying the first knot in the Loop Weave bracelet. Secure the center of the cord to your project board. Make a long bight with the right half, so the fold is 3 to 4 inches below the center. Make sure it passes over the left half of the cord as you bring it up to the top left area. Step 2: Make a bight with the left half, passing over and under the two segments of the right cord. Mentally label the left and right portions of each bight (see next photo). Step 3: Flip the left side of each bight over the right side, creating two long loops. The crossing point should be arranged close to the top of the knot. Step 4: Cross the right loop over the left loop. Curve them both slightly so they are tilted as shown. Make sure they are wide and open, so you can see the details clearly. Step 5: Weave the end that's now on the right, down through the center of the right loop (tilted towards the left). The cord should pass over - under - under - over the four segments. Step 6: Weave the left end down the center of the other loop (tilted towards the right). Pass it under - over - under - over - under the five segments. Step 7: Tighten the knot in the order the loops were made, starting at the center. It should be about 1 inch in size when you are done. 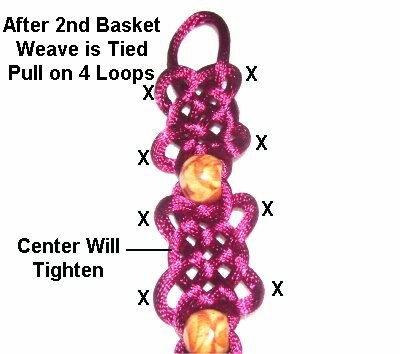 Important: Make all the knots in the Loop Weave bracelet as small as possible, so the design has a delicate appearance. 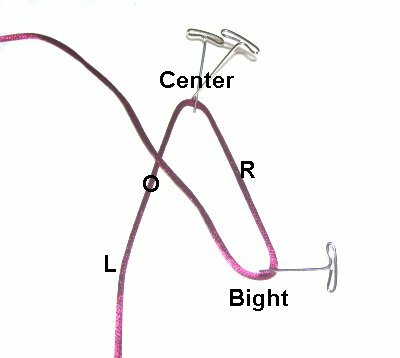 Make sure the first loop (top center) is the appropriate size for the button used for the clasp. Pass both ends through a bead in opposite directions. This will help prevent the knot from being pulled out of shape. Step 8: Repeat steps 1 - 7 to make the next knot. 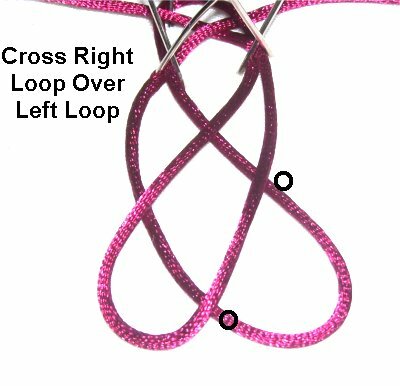 After the second one is tightened, pull on the four loops at the corners of the first knot as shown. The central portion will tighten as you do this. The loops can be any size. 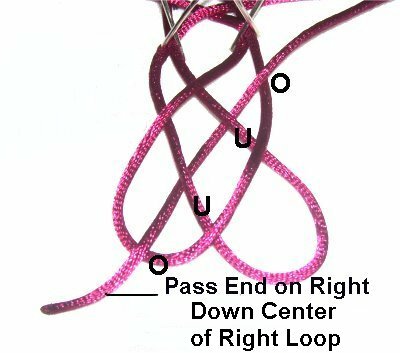 Important: Pull on the four loops as you progress, rather than wait until the Loop Weave bracelet is finished. 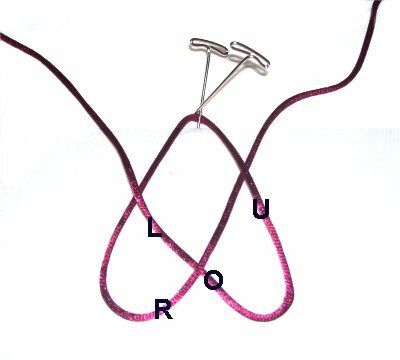 Make sure you tie one knot, then pull the loops on the knot you previously made. Step 9: Repeat Steps 1 - 8 until the bracelet is the size you need. Pass both ends through the shank in the button, in opposite directions, as you did the beads. Make sure it fits the loop at the other end. Apply glue on the shank. Tie an Overhand knot with the two ends, tightening it firmly, so it rests on the glue. Step 10: Turn over the Loop Weave Bracelet so you work in the back. Tie a second Overhand knot, applying the glue close to the shank. When the glue is dry, cut off the extra material. 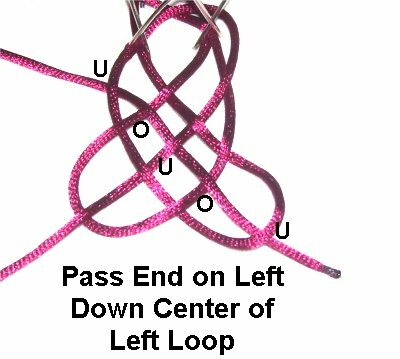 (OPTIONAL) You can give all the loops another tug, tightening the center of each knot even more. When they are as you want, apply a thin coat of glue to the back center portion of the knots. The glue will help prevent the knots from loosening as the bracelet is worn. Glue will darken Satin material, so keep that in mind if you decide to use it in this manner. Have any comments about the Loop Weave Bracelet? Contact Me.